May 5, 2018: They are both still alive and well!!! They are both about two acres away from our yard, so the picture is at full zoom. They seem very sure footed. They both kind of hop down long branches like a lemur. I saw one of them fly like a chicken about 20 feet. As agile as they looked, I can't imagine that they couldn't defend themselves at this point. Yeah!!!!! November and December 2016: Bryant was desperately trying to finish up the owl house. There were pieces of cedar scraps all over the family room! We kind of figured it would be a little late. Barred owls can nest as early as January or February, so the end of December was cutting it really close! We followed all of the directions from the Cornell site and had it mounted by the tree climbers that come to trim the trees. They added the bedding and cleared a few branches that hung near the opening. Time to wait and watch!! January and February 2017: we didn't see anything near the box except for a few little birds kind of peeking in. It was very disappointing after all that hard work. At the very least, we had a cool looking (vacant) owl house in our backyard. It looked neat among the trees and the lake. Mid-Spring 2017: Seems like there were 4 squirrels in a matter of days! Now, we have a full house!! The two babies were wild as they could be! I don't know how they didn't fall out of the tree, but they were INSANE!! :) It was funny to watch all of the happenings day after day. Late Summer 2017: Not a lot happening in the squirrel house! I can't imagine what it smelled like inside! Yuck! We happened to be outside trying to get some pictures of the owls. They were on the other side of the property. They are very hard to spot in the summer, when the leaves are on the trees. They always fly from tree to tree, one at a time, right around dusk. One of the owls flew across the back deck and in front of the owl house!! It was so exciting!! Bryant started changing camera setting really quickly to see if he could get a high speed shot. The other owl came flying across and we were not prepared! We snapped as fast as we could any ways! Ended up with a cool shot, but it's just not very focused. Still a very cool picture to get. January 2018: OMG, OMG, OMG!!!! Get the camera!!!!! I start shooting with my little camera as fast as I can just in case we missed it. We did, but I got some shots (very far away) of the owls peeking in the house and sitting on the perch!! How exciting!!! They haven't moved in yet as far as we know, but you can bet we'll have the camera ready if they do!! April 02, 2018: The Owls are living in the house! Yeah!!!! We froze our tails off sitting by the camera for almost 4 hours. Ordered pizza. Just about dusk, we were getting ready to pack up and take the few little photos we had of the top of the owls head. And then ... The owl came out!!! It was so fast but we got a shot or two! Mongo stayed in the canopy of a tree all day. The mom came to feed him a couple of times. She rips up whatever she brings and leaves it on a branch for him. Sadly, Chingy was taken by a red-shouldered hawk. It was awful! I saw the dad fly through the trees very fast and low. I went up to see what he was doing and there was the dad, chingy and three hawks in a tree. The hawks were going crazy, making tons of noise. The dad was clacking his beak and making the low noise they make. The dad and baby flew off. Two hawks chased the dad and the other one grabbed the baby owl. It went to the ground and I ran over to it, but it flew away with the baby up to a branch and started eating it alive. It was so horrible!! The owlet didn't make any noise. Very sad. No sign of BeepBeep yet, although I see the owl in two separate spots, which makes me think she's still alive! The leaves are getting thick and it is hard to see. Mongo is still in the canopy of the tree. I saw the mom come feed him once. Still no sign of BeepBeep. I still see the mom flying back and forth to two areas, which makes me think she's still alive! The leaves are so thick, you can't see anything. I guess we'll have to wait and hope we see them as they begin to fly. Pools can take a lot of maintenance and work to keep them at their best. And sometimes that work can get beyond a home owner, causing them to shut down their pool for a period of time. If this has happened to one of your clients or maybe they’ve bought a new home with an old pool that needs some help, these five steps will make it swimming ready in no time at all. Leaks can be a serious problem for pools, and unfortunately they can also spring up in nearly any type. Leaks not only waste water, they can also do serious damage to your yard by seeping too much chlorinated water into the surrounding area. Leaks also have a way of spreading if they aren’t taken care of in a timely fashion, which means that detecting and patching leaks as soon as possible will help ensure that your pool stays in great shape. Cost: The average cost of repairing small leaks in a pool is around $300. However, if the leaks or damages are severe, the entire pool lining may need to be patched or replaced, which can cost up to $5,000. If you aren’t sure if your pool is leaking or not, be sure to hire a company that specializes in leak detection to find out. DIY patch kits are available for small leaks at around $25. You can use them to patch the pool yourself if the problem isn’t extensive. Unfortunately for many pools, if they are left without chlorine and other treatment for too long, they can begin to grow things like algae and mold. While things like algae are harmless and easily removed, mold can mean a serious problem that needs to be addressed. If you’ve taken the time to clean your pool, and you’ve discovered mold growing there, you will need to have mold remediation done before filling up your pool again. Cost: The average cost of mold remediation is around $500 for a 10×10 area. Most mold companies will do a free evaluation. So if you find some stains that aren’t coming out, and you aren’t sure if they are mold, you can have them checked for free. Blue/green algae, while unsightly, can be removed with some bleach and a scrub brush. Try this first if you find stains on the sides of your pool to help get it clean. Your pool probably has a lot of equipment to maintain that helps keep it in good working order. Things like filters and pumps will help clean your pool and remove things like sediment and particles that can bog it down. This equipment needs to be stored and maintained properly when the pool isn’t in use, however. If this isn’t the case in your pool, you may need to replace the old equipment to get your pool up and running again. Costs: The cost of a new pool pump is around $800 for a variable speed, but you can find single speeds for as low as $120. The cost of a filter ranges from $150 for a cartridge filter to $700 for one that uses diatomaceous earth. Look for solar-powered pumps and filters that don’t require frequent changing to keep your monthly expenses down after the new equipment has been installed. Size both of these items to your pool; it’s just as important not to purchase something too big as it is to purchase something that isn’t too small. While most people enjoy their pool to cool off in, there are definitely times when the water can be a bit too chilly to want to enter. In this case, a pool heater can have a big impact on the enjoyment of the water for everyone. Heaters help maintain the temperature of the water; combined with solar covers to prevent the pool temperature from dropping overnight. You could potentially extend your swimming time by months each year. Cost: The average cost of a pool heater ranges from $1,800 to $2,400 for a gas or electric heater that has been professionally installed. Solar heaters installed DIY can save you the most, running about $300 to $800. Invest in a solar cover to pair with your heater to keep your energy costs down and increase the temperature even more. Invest in a heater that uses the same fuel as the rest of your home – gas, propane, or electric – to make running it easier and more efficient, or use a solar heater for the lowest expense. Fences are one of the most important parts of the pool. Not only do they keep your kids and pets safe from the water, but they can prevent neighborhood accidents from happening as well. If your pool doesn’t have a fence, or the fence it does have is in disrepair, it’s time to install a new one to maximize the safety and fun of your pool. Cost: The average cost of a swimming pool fence including gate is around $1,120. Make sure your fence is high enough, and that it’s dig proof to prevent kids or pets from getting in. Install a childproof latch on the gate to keep unsupervised kids out of the area. Once you’ve taken care of these five steps, all that’s left to do is to fill your pool, shock it with chlorine, and jump on in. You can get your pool ready for summer in just a few days, no matter what its original condition is. To find out more about what things cost, be sure to visit the Cost Guides. Maintaining and increasing your home’s value can pay off in major ways. Not only does helping your home hold value help it sell for its full amount, it can also help your home sell more quickly, help maintain your neighbor’s home values, and ensure that you’re not overpaying in property taxes. These 10 projects are listed from least to most expensive, and may help you increase your home’s value. Best part: None of these projects cost more than $2,000, so you don’t have to break the bank to take on these projects either. Fertilizing your lawn may not seem as though it’s doing much for your home’s value, but a well-maintained lawn plays a major role in your home’s curb appeal. Curb appeal is how well your property looks from the road, and has a major impact on your home’s value and resale. Fertilizing a dry, brown, or otherwise patchy lawn can help boost your home’s curb appeal, and in turn its value. Cost: The average cost of lawn fertilizing is around $.03 a square foot assuming a 6,000 square foot lawn, for a total of $180. Total costs range from $.02 a square foot for a DIY job to $.04 a square foot during peak season. If you are able to tackle this job DIY, you can save a lot of money (which you can then use to plant shrubs or trees to further increase your home’s curb appeal). Tackle this job at the beginning of the season to avoid paying peak prices. The attic is one of the most overlooked areas of the home when it comes to the impact on the rest of the home. Attics that are not properly insulated can become superheated, which can overheat the roof, cause ice dams, and raise your energy bills. Installing an attic fan can help protect your roof, lower your energy bills, and improve your home values. Cost: The average cost to install a gable mount electric attic fan is around $275 for spaces up to 2,500. Total costs range from $39 for a wind-powered vent to $321 for an electric fan to cool up to 3,000 feet. Look into getting a solar-powered fan, which will not only run when you need it, but will also lower your monthly energy costs to run it as well. Dingy, old, or out of fashion paint can really hurt the resale of your home. By giving a room in your home a fresh coat of paint, you can help remedy this problem. Choose neutral paints in light colors to get the most universal appeal, particularly if the rooms are small or dark, as these colors will help open them up and make them feel larger. Cost: The average cost to paint a 200-square-foot room is around $378, with a full range between $162 for DIY to $459 for rooms that need more than one coat of paint on the walls. If you are able to tackle this job DIY, you can save a significant amount of money, allowing you to do more than one room. Choose a color that is close to what you already have on the walls so you won’t have to apply more than one coat. While a major bathroom renovation can be costly, you don’t actually have to complete one to help boost the value of your home. Sometimes it’s enough to tackle just one or two areas of the bathroom, replacing old or outdated items with new ones to help freshen up the space and help it function better. Things like installing a new, eco-friendly water saving toilet can have a major impact on the value of the room as a whole. Cost: The cost to install a new toilet is between $300 and $500 with a total range between $100 for a DIY job to $700 for a higher-end model. Tackle small jobs yourself, such as toilet or faucet installation. Look for lightweight acrylic tubs, which are less expensive to buy and install. The backsplash is one of the most personal and trendiest places in the kitchen, because it’s so easy to install and update. Most backsplashes are only around 30-square-feet in size, so even costly tile doesn’t add up to a lot when installed here. You can use the backsplash to update an older or darker kitchen by using glass tiles to reflect light, or trendy mosaics to boost style, any of which will help boost resale value. Cost: The average cost to install 16-square-feet of ceramic backsplash is between $400 and $600, with a total range between $300 for lower quality ceramic tile to $1000 for high end, premium tile. Use small amounts of high end mosaic tiles and cut them into strips or square for borders and accents to brighten up a plain field of tile. Install the tile yourself to save on the installation costs. Old floor tile can really bring down a room, particularly if the flooring is dingy, cracked, or just out of date. Installing new ceramic floor tile can brighten up the room and improve its value at the same time. Newer tile floors are much easier to clean and maintain, and have grout joints that are both smaller and easier to keep clean than in years past, which makes this job a lasting one. Most areas that use tile – entryways, bathrooms, or kitchens – tend to be small enough to keep the costs down as well. Cost: The average costs to install ceramic tile on the flooring of a bathroom is around $700 to $900 with total costs ranging from $550 for low-grade tile to $1,000 for tile with radiant heat beneath it. Install the tile yourself to keep the costs of this job down. Look for odd-lot tile sales to get higher-end tiles at a lower price to keep the overall cost down. Old bathtubs and bath/shower units can really lower the value of your home, particularly if they are filled with mold, mildew, and old water stains. Replacing your old tub can have a big impact on the way the rest of the bathroom looks, which can therefore have a big impact on your home’s resale value. Cost: The cost of installing a new bathtub is around $1,006 for a standard fiberglass tub/shower with a total range from $143 for a low cost bathtub installed DIY to $1,857 for a high-end cast iron bathtub. Use a lightweight acrylic tub or tub/shower enclosure, which costs a lot less than cast iron tubs. They are also a lot lighter, and therefore cost less to install as well. New wood flooring can transform a home. Wood flooring also has a major impact on a home’s value and its ability to be sold in a timely way. Bamboo flooring is an eco-friendly wood flooring option that also costs less than many other hardwoods, giving you the look of wood for less, along with sustainable design. Cost: The average cost to install bamboo flooring in a 16 x 16 room is around $1,250, although costs can vary greatly by region. Float the floor for an easy installation that you can tackle DIY. Purchase the flooring from a local seller to cut down on shipping costs. Nothing lowers the resale value of a home faster than old carpet. Carpets can be notorious for hanging onto smells, stains, and allergens, which make them a major turn off for home buyers. Replacing old carpet with new can have a major impact on your home’s value. Cost: The average cost to install new carpet in a 16 x 16 room is between $1,200 and $1,400, although costs can vary greatly by region. Cover up old carpets temporarily using new throw rugs to hide stains. Invest in stain-resistant carpeting to lengthen the amount of time before you need to replace again. Water damage can take a major toll on your home’s value. Water can cause wood rot, mildew, and black mold in your home, as well as unsightly stains, all of which can lower your home’s value if you don’t repair them in a timely way. Tackling water damage should always be done as soon as possible to help minimize the amount of damage that will ultimately occur. Cost: The average cost to repair water damage in an 80-square-foot bathroom is about $23 a square foot, which translates to around $1874, although this figure can be impacted by what the damage is and how much needs to be replaced. Use fans after the water has receded to help dry things out before damage like mold can set in. Do the tear out of damaged materials yourself to help eliminate some professional fees. No matter how small your budget is, there are always things that you can do to help increase or maintain your home’s value. To find the costs of more ways you can improve your home’s value, be sure to check out the Fixr and How Much cost guides. The Ultimate Spring Cleaning Checklist by Terrys Fabrics. Household chores are a fact of life — no matter how we tackle them, there’s no getting around them. Sometimes we divide them up among family members and try to turn them into a game; at other times, we simply integrate them into our weekly routine. Either way, we’re eager to make them as easy as possible, and we want our tactics to be both cheap and effective. Because 33 opinions are better than just one, we’ve asked the global Houzz community for household cleaning tips that will transform the novices among us into veritable pros. From herbs for deterring insects in Australia to green tea for banishing bad smells in Japan, these magic tips have one thing in common: They’ve been tested and approved by the best experts around — you! 1. Scatter a handful of bay leaves in the pantry to deter critters, such as flies and weevils, says Houzz Australia user georgi02. 4. Putting out a saucer of cotton balls steeped in vinegar will quickly eliminate cooking smells, such as from cauliflower or cabbage, says Houzz Australia user islanine. 6. Mix vinegar with detergent in the dishwasher to keep your dishes shining, says Houzz Italy user Marta Fincato. 7. Also proclaiming the power of vinegar is Houzz Italy user mikea62, who notes you can use this versatile ingredient to remove limescale from your kettle. Simply mix one part vinegar to one part water in the kettle, bring to a boil and let sit for about 15 minutes. 8. When it comes to keeping the fridge clean, Danish Houzzer Pernille Jensen says it’s a good idea to keep food away from the back wall, as bad smells can develop. “Food residues get attached to the ice [at the back of the fridge], which then melts and becomes moldy water.” Check your refrigerator once a week to avoid a big clean. 11. “If you want to make your silverware sparkle like new again, take a container that’s big enough to hold all your cutlery, line it with aluminum foil, and fill the base of the container with salt. Now fill the container with water, place your cutlery in it, and stand back and admire the results,” says Houzz France user Yves Chasselin. 12. For many Houzzers, natural solutions work best. Baking soda, vinegar, lemons, borax, and newspaper were among the things suggested for cleaning glass and windows. “We really don’t need chemical cleaners,” says U.K. Houzzer Laara Copley-Smith of Laara Copley-Smith Garden & Landscape Design. 14. Use lint rollers to remove dust from lampshades, says Houzz Spain user Maria BM. 16. “I love my vacuum cleaning robot! It works exactly as I imagined it would: It’s quiet, thorough and completely reliable. My little helper impressed me so much that I decided to buy a robotic lawn mower too,” says German Houzzer kirchmaier. 18. “To clean your floor tiles, mix 1 pound (about 450 grams) of oat bran with about 10 pints (5 liters) of water and let sit for roughly 25 minutes. Once the mixture is ready, use a sieve to strain the liquid, which you now use to clean your floor. Leave it on the floor for five minutes before rinsing it off with clean water. Works a treat,” says French Houzzer Germaine NGDEAN. 19. To clean and polish wood floors, make a small bag the size of your palm using a worn-out cotton cloth such as an old T-shirt. Fill the bag with rice bran and sew up the opening. Now moisten the bag a little and use it to clean and polish flooring, walls — in fact, anything made of wood, says Houzz Japan editor Atsuko Tamura. 21. “I don’t know if it’s unusual or a bit dangerous, but I use razor blades to remove the limescale around faucets and in the bath tub. It works very well,’’ says Houzz Denmark user Trine Nyborg. 23. A good tip, which also happens to be eco-friendly, is to use vinegar to remove limescale from a shower door. “I macerate orange peels with a liter (about a quart) of vinegar in an airtight bottle for a fortnight — this improves the smell (although the smell of vinegar disappears quickly). Then, as already recommended, I dry it either with an old newspaper, or, if the frame is made of white plastic, I use a cotton cloth,” says Ana Triay of Houzz Spain. 25. Use vinegar and baking soda to clean shower doors, stainless steel, ceramics, porcelain and drains, says Australian Houzzer georgi02. 26. “Don’t use fabric softener with towels — it creates a coating and prevents them from absorbing water when you dry off your body. Use white vinegar instead,” recommends U.K. Houzzer saratoga brown. 27. Houzz Italy user Serena Meneghetti pours one or two glasses of vinegar into the toilet to get the bowl sparkling. 28. “When you’re sick, cut an onion in half and place it on the bedside table — it will absorb any harmful bacteria in the air,” suggests Houzz Australia user Jamie Bailey. 29. “In old apartments, the smell of damp can sometimes be transmitted to clothes stored in closets. To solve this problem, simply use a piece of newspaper rolled up into a ball to absorb the humidity and a glass of warm white vinegar to get rid of the smell,” says Houzz France user Isabelle Blanc du Collet. 31. To remove ink from clothes, spray them with hairspray, then wash them as you normally do, says Houzz U.K. user 163hrd. 32. To get rid of odors in closets and shoe cabinets, place some charcoal in a small piece of gauze and leave it inside the enclosure, says French Houzzer Germaine NGDEAN. Melton Team DIY project: making an end grain butcher block island. About a year ago we purchased a pile of lumber from a retired woodworker. He had scraps big and small of maple, walnut, cherry, mahogany, curly maple, cedar and oak. We purchased everything for $50. I will post more projects we've done with the wood at a later date. In the pile of wood, were 3 buckets full of little cutoff blocks. One bucket had 3-4 inch pieces. The other two were mixed with pieces that were 5-10 inches long. All of the pieces had at least one side that was rough cut (fuzzy). I started out by gluing the flat sides together in groups of three; making sure the colors were contrasting. Note: This is probably the most difficult way of even attempting to make a butcher block. Normally, you'd use long, straight stock that you could glue together and cut in large chunks to flip to the end grain side. This was like putting together a puzzle where none of the pieces fit perfectly together. The little pieces were too small to go through a planer without also sending your hand through it; so I spent a good amount of time sanding and shaving the sides to make them fit snug. I probably could have used Titebond II but I went ahead and used the green waterproof Titebond III glue. The wood cost less than the glue for sure. The last parts of the project were the most fun. I had everything in one big block that weighed just under 75 pounds. There were some cracks and chips that I left along the way so I could fill them. I wanted it to look kind of hodge podge and not like it came out of a machine. It was at this time that I decided to spice it up a bit with some crushed turquoise and pyrite. I also decided to add four diamonds of turquoise, using an acrylic pen blank cut into 4 pieces. I got a little carried away! I epoxied them in place. I also used epoxy with the turquoise and pyrite inlay. I would normally use CA glue, but it was such a wide area that I wanted to make sure it was rock solid. The legs and apron were made out of red oak and joined together with 1/4 inch dowels as well as metal corner braces. Overkill? Yes! The legs are finished with primer and flat black spray paint. The wood on the bottom is another project I did for a Singer table top. I decided to use another one I had made, so I cut this one to size and used it on this project. Good luck on your next project! You know that feeling when you’re trying to whip up a quick dinner after work and everything in your kitchen seems to be conspiring against you? You can’t find the ingredients you could have sworn you had, things are tumbling off the shelves, and nothing is where it should be. If you know what I’m talking about, then it’s time to declutter your kitchen. A good way of figuring out what constitutes clutter is to ask yourself two questions: Does it serve you anymore? Does it bring you joy? If the answer to both of these questions is no, chances are you won’t even notice when the item is gone. So let’s have a look at common space wasters and how to get rid of them. Save the tidying for later. Don’t make extra work for yourself. If you want to make your kitchen more functional, declutter it before you do any tidying. Otherwise you’ll mess everything up in the process of decluttering. And there’s no point tidying up things you’ll eventually throw out, donate or sell. Purge your pantry. Go through your pantry or the cupboards that hold your cans and jars and remove any out-of-date products. When I recently challenged some of my clients to do this, they couldn’t believe their eyes, finding cans dating back to 2007. If you think an item is something you might realistically use, pull it out, put it on the side and give yourself a deadline by which to use it (assuming it’s still safe to eat). If you haven’t used it by then, get rid of it. Minimize the plastic. Next, it’s time to tackle the plastic bags and plastic bottles. Many of us have a tendency to keep things “just in case.” But then instead of keeping one just-in-case plastic bottle, or the few plastic bags we might realistically reuse, we keep 10. Select a couple of really durable bags and perhaps a bottle or two if you think they might be useful, and create a place to store them neatly in your kitchen. Recycle the rest — you’ll never be able to use them all. Sort your food containers. Do you find yourself overwhelmed every time you open the dreaded drawer or cupboard with plastic containers? It’s time to take them all out, give the space a good cleaning and match up all of your boxes with their lids. Throw out any that don’t have a match and, if your collection isn’t a neat set like this one, consider storing them with their lids on. It’ll keep them clean while in storage and, although they’ll take up more space, it will make them easier to use. Cull your dishware. Do you have lots of dishes, including old and new sets mixed together? Figure out exactly how many dishes you need by putting away the older set away for a week and seeing how you get on. If you do just fine without it and you’re not attached, it might be time to donate it to charity. Prioritize your appliances. Kitchen appliances can be real space wasters. They’re bulky, and a lot of them get only occasional use. That’s why you want to make sure you keep only the ones you use daily, or a minimum of a few times a week, out on the countertop. If you make waffles only as a treat, pack the waffle maker away on a high shelf and take it down only on those occasions. Keeping the countertops clear is a great way to make a kitchen feel larger and less chaotic. Streamline your utensils. Go through your cooking utensils and donate any you haven’t used in more than a year. Then sort them, putting like with like, and keep them easily accessible near the range. Try to find a dedicated spot for them, whether it’s a spare drawer you can neatly organize or a bit of extra countertop space for some containers. Get your foils and wraps in order. A great idea for organizing wraps is putting them all into one drawer. But be careful — you don’t want it to become a designated drawer for “a bit of everything.” Make sure you keep the rolls tidily next to one other and, if you wish to add anything else, organize everything with a tray or container. You don’t want random objects lying around — they definitely won’t help when you’re trying to pack a sandwich in a rush. Sort recipe books and takeout menus. Have a look through all your cookbooks and takeout menus and keep only the ones you actually use. If you haven’t cooked from a book in the past year, gift it to someone who’s looking for new inspiration. You’ll free up some space on your shelf, and the book will make someone else happy. If you haven’t ordered food from a certain place for a while, the same rule applies — and with so many menus available online, there’s less and less reason to clog up a shelf or drawer with paper copies. Create a box of items you’re not sure about. If you’re not sure whether you’re ready to say goodbye to some items, put them all in a box, write the date on that box and move it to a garage or loft. If you come across the box in, say, six months, and realize you haven’t been looking for those items, it might be easier for you to let them go. And remember, by getting rid of the old, you’re actually making space for the exciting and new. Chemical based cleaning products have drawbacks: They’re pricey, they may trigger health issues and their manufacture, use and disposal can harm the environment. So if you’re approaching a spring cleaning of your home this year, why not consider these effective all-natural cleaning alternatives? Have your copper pans lost their shine? Dip half a lemon in salt or baking powder to scour your pans to their former glory.Mix a bit of lemon juice with baking soda to remove stains from plastic containers. Combine lemon peel and white vinegar in a jar, allow to marinate for a few days, then strain out the peel to use the vinegar as a cleaner. A small dish containing vinegar and lemon juice will absorb odors.Rub a slice of lemon across your chopping board to disinfect the surface. Baking soda, like lemon, is another one of nature’s cleaners. Also known as sodium bicarbonate, this mildly alkaline substance functions as a gentle abrasive, deodorant and more. A thick paste of baking soda and water can be useful in removing surface rust. A more liquid mixture of baking soda and water can function as an all-purpose light cleaner that’s particularly effective on grease. Clean your oven. A thick paste of baking soda and water can be applied to the bottom of the oven to clean it. Let it sit for a couple of hours or overnight before scraping it off and wiping the surface. Brighten the bowl. Baking soda also is a winner in the bathroom. Throw a cup of baking soda into the toilet bowl and let it sit for more than an hour. Then add a cup of white vinegar, let the mixture sit for a while longer, and flush. Safely clean your clothes. Baking soda also is a great addition to your laundry room. When added to your washing machine, it can soften your clothes and remove any unpleasant odors. Fun fact: If your clothes happen to be contaminated with uranium, add a cup of baking soda to the wash to get rid of that pesky nuclear radiation. This sounds like a joke, but it’s not. Apparently scientists have discovered that sodium bicarbonate will bind with depleted uranium dust and remove it from clothes, which chemical detergents can’t manage. Talk about an all-purpose cleaner. Nonetheless, don’t go playing in uranium dust anytime soon, kids. Mentioned a couple of times already, white vinegar is a weak acetic acid that can be used in almost all aspects of home cleaning, as it has strong antibacterial properties. Vinegar diluted in water is an effective stain remover for various textiles. It’s also a great natural deodorizer, and can be combined with various other natural products, such as lemon juice, to absorb odors. Simmer vinegar with water on the stove while cooking to prevent cooking odors. Vinegar can help remove strong scents left over from fish, onion and garlic too. Refresh your dishwasher. If your dishwasher could use a thorough cleaning, ditch the expensive chemical tabs and instead fill a dishwasher-safe bowl with two cups of white vinegar and set it on the top rack. Let the otherwise empty dishwasher run one cycle to get rid of any odors and bacteria. Descale your kettle. Vinegar is your friend again here, although you can use lemon juice, too. Pour a 50/50 mixture of white vinegar and water into your kettle, allow it to boil, then rinse the kettle out once it cools down a little but is still warm. Make your windows shine. Vinegar to the rescue again. Fill an empty spray bottle with a 50/50 mixture of white vinegar and water and use a microfiber cloth to wipe down your windows and avoid any streaking. This also works wonders for mirrors. Keep those tiles sparkly. The grout between tiles in the bathroom can quickly accumulate mold, which is both unsightly and unhealthy. Remove it by mixing one part carbonated water with one part white vinegar and spray it on the moldy areas. If the grime still doesn’t scrub off, add two parts baking soda to the vinegar-water mix to make a thick paste. Let the mixture sit on the grout for at least 15 minutes before scrubbing it off. 1. Get watering right. Masley says poor irrigation is the No. 1 reason edible container gardens fail. Soil in containers dries out especially quickly, so check soil moisture frequently. In an especially sunny or windy location, this may even mean watering daily or twice a day. Avoid overwatering, though, as that can create fungus and root rot. Though you can water by hand, installing an automatic drip line is the easiest and most consistent method. Masley recommends making a loop out of the drip line around the plant, instead of using a single dripper. It distributes water better, preventing plants from drowning or drying out. He also tops containers with compost to lock in moisture better. 2. Prep your soil. Ask people who grow a lot of edibles for their secret, and chances are they will all tell you the same thing: good soil. Container gardens need soil that is quick draining, moisture retentive and nutrient rich. Nurseries sell organic potting mixes, but you can also make your own. Masley warns against using soil directly from the yard as it often contains clay and silt, causing drainage problems. Mix all of these together. Masley builds organic soil amendments into the soil from the very beginning. The nutrients slowly release throughout the growing season, so all you need to do is water. He also adds a special ingredient to his soil: worm castings. Dried worm castings work, but Masley uses fresh ones — with live worms. The worms are very efficient at cycling nutrients and converting them to a form that is usable for plants. “They also enrich the potting soil with beneficial bacteria and fungi that compete with pathogens that might attack your plants,” he says. Masley uses coir in his soil mixture for increased water-holding capacity. Though many organic potting mixes suggest peat moss, Masley prefers coir. Peat moss repels water if it dries out, while coir will always absorb water and is more sustainable than peat. 3. Resist overcrowding. Overcrowding is a major container farming pitfall — one mistake that I know I’m guilty of. If one tomato plant is OK, then two must be good and three must be better, right? Unfortunately not. Masley says most plants need 5-gallon pots, including these pepper plants — one pepper plant needs a 5-gallon pot. Though packing in the plants may seem like a foolproof way of accounting for the failure of some plants, you are actually hindering the success and productivity of all the plants. Multiple pepper plants in one container will be in constant competition and most likely will produce less combined than one healthy plant would have. Masley says you are also setting yourself up for a lot of work with pest and disease management. “Crowded plants are stressed by competition,” he says, “making them more susceptible to pests and diseases and reducing their yields.” Give yourself a break and think one plant, one pot. 4. Give your edibles enough light. As with other edible gardens, six to eight hours of good light is ideal for container gardens. South- and west-facing spots are best, but it’s possible to grow edibles on north- and east-facing locations — it’s just trickier. In areas that receive less sunlight, Masley suggests planting earlier-harvest varieties. “If you really want to try a tomato, choose a cherry tomato instead of a beefsteak tomato,” he says. “Peppers like ‘Ace’ produce fruit in 70 days and may work.” Increase the spacing between the plants, say to 8 inches from 6 inches, to allow the leaves to grow and attract as much light as possible. Lettuces and greens grow well in a little less sun. You’ll just have to try different lighting conditions and see what you get. 5. The bigger the pot, the better. Yes, edibles will grow in smaller containers, but you’ll be putting yourself in a difficult spot right off the bat. The larger the pot, the deeper the roots can establish and the more resilient the plant will be. The roots will be stronger and able to hold water better and longer, helping out with your No. 1 problem. “The soil holds more water and takes longer to dry out,” says Masley. “The plants are also stronger, more resilient, and better able to handle the stress of drying.” Resist the urge to plant in those tiny random planters you have scattered around and buy the big pot first. 6. Not all containers are created equal. The size of the container, as well as its shape and material, will contribute to the success of your edibles. Masley prefers globular or cylindrical pots to the traditional tapered pot. The tapered pot exposes a greater percentage of its soil to direct sunlight, leading to dry soil faster. “The top few inches of soil are always dry, so that zone is basically useless for the plant,” he says. When you minimize the exposed soil, you minimize the amount that will dry out and help keep the roots hydrated. Depending on your garden’s exposure, the color and material of your planter can affect the plants too. Southern- and western-facing spots, which receive ample sunlight, benefit from lighter-colored pots (which reflect sunlight), while northern- and eastern-facing spaces need more heat and can be planted in darker containers. Metal planters will also help warm up the soil in those cooler and darker areas. Terra-cotta pots are always good, too. For those who may need to move their planters a lot (renters, perhaps), Masley suggests fabric containers. They pack flat and are very portable. 7. Save space with a window box. Masley suggests window boxes, especially for growing lettuces, to save space. Though they are shallower than other containers, they’re longer, so roots can run the length of the planter’s base. The wood keeps roots cool, and mounting the planters on the wall minimizes the space they occupy — great for small decks and porches — and makes harvesting a breeze. 8. Start with herbs. Herbs are resilient; they’re the easiest edibles to grow and also the most convenient to have in a pot near the kitchen. How often do you actually need more than a snip or two of rosemary or basil? Thyme and oregano are especially resilient. “Basil is a must for any cook’s summer garden,” says Masley. He grows Gevovese and Napolitano (saladleaf) basil for pesto, and ‘Mrs. Burns’ Lemon’ basil for seafood and shellfish dishes. He suggests a 1-foot-diameter pot for herbs. 9. Try cherry tomatoes. Tomatoes are great container plants, but it’s easy to forget to water them enough in the heat of summer, and tomatoes can fall victim to blossom-end rot, a problem caused by water and calcium deficiency. Masley suggests trying cherry tomatoes instead. They are less susceptible to blossom-end rot — the smaller the tomato, the easier it is to grow. Plant them in at least a 7-gallon container. In cool zones try placing your pots directly on the ground to absorb additional heat. Consider darker containers or containers made from metal to warm up the soil. If your site is especially warm, place the pot on a spacer or consider a mobile salad table to shade plants from afternoon heat. Color has always held a special place in my heart. When I was about 9 years old, my parents came up with the great idea that they would let my brother and me redecorate our bedrooms. For me, a young, creative and somewhat excitable child, this was the equivalent of being let loose in a dream world. Off to the paint store we went to choose our new hues. I remember this moment vividly, because I ran around picking out swatches and making color combinations I thought were fantastic. Had my parents known that they would walk out that day with a can each of Sunflower Yellow, Lime Green and Wedgwood Blue, they may have thought twice about giving us the ultimate creative control. Sorry, Mum and Dad! A little knowhow can go a long way when painting, whether you’re choosing neutrals, pastels or brights. Follow these rules to help guide you to your next color triumph. 1. Be your own client. Before you start any home modification project — even something seemingly small, like a single feature wall — spend some time researching and getting a sense of what you’re trying to achieve. When people come to me for design services, I always start by asking a series of questions to get a sense of what my clients are after. Think about what you would say to someone who is looking to understand your painting dreams. For example, what are your favorite colors? (Think clothing.) Is there a feature — an artwork, for instance — you want to help stand out? How do you want to feel in the room? 2. File images you don’t like. Use Houzz to gather images that inspire you and save them into ideabooks. With your selection of images, write what you like and, equally important, don’t like about each image. Watch for patterns that emerge. For instance, you may find that your favorite color for accessories is your least favorite color for walls, or that the color you were dreaming of for the bedroom is perfect for the kitchen. 3. Measure your room. Before you set foot in a hardware store, make sure you have measured the surface area you’re going to paint. Each can of paint will cover only a certain area, so go in prepped and save yourself from buying too much or too little. Most retailers have paint calculators to help you work out the amount. 4. Go with your gut. When it comes to love at first sight, especially when talking color, it’s real. I am a firm believer in trusting gut feelings. If you have always loved a certain color, you will probably always love it. Grab the things that jump out at you. Hardware stores and paint stores, with their vast range of sample paint swatches, are great sources of inspiration. Don’t be shy about taking a bunch of samples home with you — that’s what they are there for. 5. Always test first. I always suggest trying out a test batch before taking the plunge and painting an entire wall. Before slapping paint on the wall, find or buy a thick white card and paint it, not the wall. The white card will give you the best impression of the paint. Having the paint on a card means you can stick the card to your wall and move it around to see how it looks in different places and against different furniture. Stick the card to your wall and leave it for several days. Take note of how the light affects it at different times of the day — in shade, in full sun, at night under artificial light. Color changes in different lights, and it could make you change your mind about the color you’ve chosen. By painting the card, it also means that if you decide you don’t like the color, you won’t have done any damage that will need patching! 6. Prep your wall. Your new paint is only as good as the wall you’re painting, so make sure you take all the necessary steps in prepping the wall for it. Start by removing picture-hanging hardware, pins and nails, and patch the exposed holes. Wait for the filler to dry completely before sanding back the excess. Once you’ve patched and sanded back the holes, wash the walls to remove dirt, scuff marks and grime, along with the excess filler that you’ve used to patch those holes. 7. Apply a primer. A primer is absolutely necessary if you are trying to paint a light color, like yellow, over a dark wall. Primers also are necessary for new walls (especially drywall) as the raw surface is absorbent. The primer will provide a barrier between the raw material and the finish, which will save the amount of topcoat paint you need to apply for your final color. Treat any painting job as you would a fresh surface, and apply a primer before embarking on any painting journey. It will help make your colors richer and save you time and effort in the long run. 8. Choose the right paint base. There are different paint bases for different applications, and each has a different formula that is specially made for the environment it is intended for. For example, if you’re painting your kitchen or bathroom, choose a paint base that has antimicrobial particles in the paint itself, which make it more resistant to mold and mildew. If you’re painting an exterior, choose a paint base that is formulated to deal with UV light from the sun, so the colors won’t fade. Ask an expert in the store to help you choose the right base. 9. Choose quality over quantity. When it comes to painting tools and materials, spend a little extra on decent masking tape, brushes and rollers. Not only do high-quality tools make the paint last longer, but they will also help the paint adhere to the wall better and will be less likely to leave roller fibers and brush hairs on your walls. 10. Seek help if you lack confidence. If you’re not confident in making color decisions by yourself, consider contacting a local designer, decorator or color consultant; don’t wait until it’s too late. It is our job to help you visualize your space, as well as to offer a different perspective and ideas that you might not have thought about. The same goes for painting. If you’re not into DIY and couldn’t think of anything worse than painting a wall (let alone a room), there are plenty of professionals out there who will be able to do the work for you. Ready to Build Your 'She Shed'? About a year ago I produced a few reports on the explosion of 'man caves' - those converted rec rooms, basements and, in some cases, separate out-buildings decked out with all the creature comforts that men crave. So in the spirit of equality, we're going to spend a couple of accompanying segments on the female equivalent of the man cave: the she shed. These spaces have become all the rage, so let's figure out how to outfit one of these functional and often beautifully decorated out-buildings just for you! Sara Yang at House Beautiful showcased a number of them in a recent blog, including a very feminine unit in a relatively tiny 8x12 foot outbuilding painted white inside and out, with glazed French Doors, delicate white cotton curtains, a matching wicker chaise and spindly white metal furnishings accented with a couple of patterned throws and a floral print on the wall. She shows another, more ambitious she-shed interior outfitted like a '50s malt shop with a bright red and white wrap-around booth, a pink antique pay phone, mini bar, fridge and popcorn machine. Nicole Jewell at inhabitat.com mentions that Writer Barbara Techel loves the premise behind the shed idea, but prefers to call hers a “Zen Writing Cottage.” She also encourages women to put their own personal sense of style into the decor of their sheds to really make the space a personal retreat. Techel says that her cottage, which she built with the help of her husband eight years ago, is full of her own special touches. She decided to hang three different whimsical cardboard cutout fairies from the ceiling in front of three of the cottage's long windows that slowly spin catching her eye now and then as she relaxes to the meditative stream of water from a tiny tabletop fountain. In our next post we will further explore the inner workings of the she shed, so stay tuned! No matter your preferred style, throwing in a touch of the old can add unique personality to your space. One such item I’ve noticed clever Houzzers using in every room of the house are antique sewing machine tables and cabinets. Whether they serve as dining tables, dressing tables, vanities, consoles or desks, these charming pieces are true furniture workhorses full of nostalgia and style. Marked by lovely ironwork and often still including the sewing machines, there’s a place for them in every room of the house, and even in the yard. He shored it up so it could take the weight of the sink and countertop, restored it and repurposed it into a unique vanity base, topping it with a counter and backsplash composed of recycled glass from Skyy Vodka bottles. Other green elements in the room include a repurposed vintage claw foot tub, a repurposed urinal found at ReStore and Marmoleum floors. Likewise, in this creative home belonging to a hatmaker and a musician, a sewing table base topped with wood serves as a funky console that befits their creative decorating style. Using a sewing cabinet or table as a vanity base suits many styles, as you can see in this transitional bath. This antique cabinet features drawers and intricately carved wood. A contemporary sink, wall-mounted faucets and new counter-backsplash give it transitional style that suits the home. In the bedroom. If you find a table that’s missing the sewing machine, or if it’s simply too clunky for you, you can always remove it. These pieces work well as an extra side table in the bedroom, as seen here, or repurposed as nightstands. In the mudroom. In this converted New Hampshire barn, a sewing table serves as a handy console where the homeowners can drop their keys and gloves as they walk in the door. In the kitchen. This designer specified an antique sewing table base topped by reclaimed wood from a Northern California barn for this unique kitchen table. It’s hard to believe this Vermont kitchen is new. The antique sewing table and cupboard helped achieve the historic-farmhouse look the owners desired. In this banquette area, the homeowner topped the antique Singer table base with a piece of scrap marble a friend gave her. In a hallway. In this chef’s country home in Bucks County, Pennsylvania, antiques add to the relaxed feel throughout the house. Here, the wrought iron sewing table legs serve as a wonderful base for a console covered in vintage bottles. Antique washboards add to the tableaux. In the family room. A reclaimed top converted this sewing table base into a sofa table that’s just the right height for a reading lamp. It also solves the issue of entering the room and seeing just the boring back of a sofa; the unique table catches the eye and delights right away. In the yard. Outside a Cape Cod farmhouse built in 1751, a stone patio gets artistic character from a reused sewing table base. A square top transforms it into an al fresco spot for four, and the rust just adds to the colorful landscape and home. If you’re having trouble finding antique sewing tables and cabinets at your favorite shops and flea markets, try online sources like Etsy, eBay, Chairish and craigslist. I did a quick online search recently and found that there are many sewing table and cabinet bases in good shape available for about $250. 1. Start with the Front Door. Believe it or not, your home’s front door can be one of its most important assets. A new steel entry door consistently ranks as one of the most rewarding projects in home repairs, yielding an increase in home value that’s greater than the costs to install one. Likewise, to make the door especially captivating, consider painting it a bold, pleasing color that will grab attention and add charm. When buyers see a new door that looks attractive, they see another asset that makes your home the one to buy. 2. Make Any Necessary Repairs. Is the driveway cracked or the front doorbell busted? Now is the time to call a repair company or get out your own toolbox to make repairs. Buyers want turnkey, move-in-properties, and that means they want properties with repairs already done. Do the work now to get your home in ship-shape condition. 3. Keep Up with Landscaping. From mowing the lawn to pulling weeds, make sure you’re keeping up with your outdoor landscaping so that your home looks presentable and well cared for at all times. Overgrown bushes and dying plants are a surefire signal to potential buyers that you’re not caring for your home and leaving more maintenance for them to handle. 5. Touch Up Paint. A fresh coat of paint is just as powerful outside as it is inside, so to update your home’s look, repaint the exterior or at least touch up problem areas. Another idea is to paint the trim a new color that creates either a nice complement or contrast to your home’s overall look. 6. Make Over the Mailbox. You might not think a mailbox matters much, but it’s yet another one of those little details that can add up together to make a strong impression on a buyer. 7. Add Outdoor Furniture. From rocking chairs on the front porch to an outdoor patio set on the back deck, outdoor furniture creates outdoor living spaces that expand your home’s appeal. Look for attractive, durable pieces that will endure weather damage and look good for years to come — whether or not you include these pieces with the home sale, setting them up is a great way to stage your home for greater resale value. The bottom line when it comes to curb appeal is that a little investment today can add up to big rewards tomorrow. Take the time to update, clean, repair and add value to your property’s exterior now and you will make it more attractive to buyers, not to mention more beautiful to come home to. Use the tips above to get started now. Jessica Kyriakos is Brand Manager of Superior Site Amenities in McAlester, Okla. She has worked in the site furnishing industry for more than 15 years. This post was originally published on RISMedia's blog, Housecall. Check the blog daily for winning real estate tips and trends for you and your clients. Rethink the lighting fixtures – Swap out the lighting fixtures that came with the house for something you really love. The right overhead chandelier or well-detailed wall sconces can add drama and grace to any entry. Don’t overcrowd the space – If you're blessed with an entryway big enough for several pieces of furniture, by all means, go for it. But if the area is on the small side, skip the console table because the area will look better with just a few small pieces. A plant stand and a mirror may be all that is needed to dress up a small entry. With summer on the horizon, many of us are currently planning our summer parties. However, there is quite a distance between wanting to throw a great summer party and actually pulling it off. So we'll look at some of the big challenges summer party hosts may face. When it comes to planning a summer party, lifestyle expert Ceci Carmichael recently told blogger Candace Rose Anderson that people avoid entertaining because they just think it’ll be so full of stress and they’re not going to have a good time anyway. Carmichael's best advice—plan ahead. That means two weeks out get your list all set, get your menu all set and then along the way take bite size chunks out of it so that the day before you aren't walking a tightrope between vacuuming and cooking at the same time. Freshen up with Color: Don’t be afraid to add pop to your party with bright colors. Purchase a fun, colored table runner for outdoor tables and a set of patterned napkins for a fresh look. Include a few brightly colored dinner plates alongside basic white dishes. That simple pop of color adds excitement to the table. Plan a Picnic in Your Own Backyard: Surprise your guests by setting up an outdoor picnic area. Spread multi-colored throws, blankets even large quilts on your grass and add bright colored pillows. The “eclectic look” is in! Place fun trays on the blankets filled with guacamole and chips or bottles of water and glassed bottled soda pop. Light up the Garden: Lanterns placed throughout your outdoor area are always noticed! They can hang from gazebos or line the walkway into the party. These lanterns use battery-powered candles as an alternative to regular candles… they’re gorgeous and are safe too! Invest in a Bar Cart: Freshen up your bar by adding a bar cart to the area where your guests are gathering. The bar cart can be filled with alcoholic drinks for the party goers, or for an outdoor family event try beautiful pitchers of lemonade or iced lavender hibiscus tea. Recently, I took my bar cart and filled it will fun desserts that the guests could try at their leisure. Although installing hardwood flooring is usually more expensive than rolling out new carpet, it’s an investment worth considering, according to data from the National Association of Realtors. Surveys show that 54 percent of home buyers are willing to pay more for a house with hardwood floors. The question now: What’s the best way to clean and care for that popular flooring and keep that natural beauty (and value) shining through? Here’s how. It’s not the wood — oak, maple, mesquite, bamboo, engineered hardwood or something more exotic — that determines how the floors should be cleaned, but rather the finish. Surface finishes, often referred to as urethanes or polyurethanes, are among the most popular treatments today and are usually applied to hardwood floors after installation to protect them and make them more durable and water resistant. These finishes create a protective barrier. There are four types of surface finishes, according to the American Hardwood Information Center: water based, oil based, acid cured and moisture cured. Homes built before 1970, including historic residences, may have original wood floors that were sealed with varnish, wax or shellac. These require a different approach to cleaning. The American Hardwood Information Center says these types of finishes work by penetrating the wood to color the planks and form a protective shield. Using a wax coating after staining provides a barrier against wear and tear and gives the floor a beautiful low-gloss satin sheen. The classic look requires a little extra TLC, however, since water-based products and mopping can damage the finish. Run your hand over the wood. If you can feel the texture of the grain, the floor has a “penetrating” finish (usually a combination of a natural oil, such as linseed or tung oil, mixed with additives for drying) topped with wax. In an out-of-the-way spot, dab on a little paint remover. If the finish bubbles up, it is a surface finish, like polyurethane, which coats the floor in a protective layer. In an out-of-the-way area, place a few drops of water. If the water beads up and does not soak into the wood, the finish on the floor is intact. If the water is absorbed into the floor or leaves a dark spot, the wood is unfinished or the protective layer has worn away. If you sprinkle on a few drops of water and white spots form beneath the droplets after about 10 to 15 minutes, the floors are sealed with wax. To remove the white spots, use a piece of fine steel wool lightly dampened with wax and rub gently. If you suspect a varnish or shellac, take a coin and scratch the surface of the floor in an inconspicuous corner. If the floor has been sealed with one of the older finishing methods, it will flake off. Not wearing shoes in the house is one of the best ways to significantly reduce dirt, scuffs and daily wear and tear, and lessen cleaning time. The National Wood Floor Association, or NWFA, is more specific and warns against walking on wood floors with cleats, sports shoes and high heels. It also offers this cautionary example: A 125-pound woman walking in high heels has an impact of 2,000 pounds per square inch. Furthermore, an exposed heel nail can exert up to 8,000 pounds of force per square inch. Whether you got out your calculator or not, the possibility of impact and denting appears to be undeniable. However, while you can’t always ask guests to shed shoes at the door, it might be a policy worth considering for family members. No matter what type of wood flooring you have, the NWFA advises against using cleaning products meant for vinyl or tile flooring. Their take: Self-polishing acrylic waxes cause wood to become slippery and appear dull quickly. Another no-no: wet-mopping wood floors, since standing water can dull the finish, damage the wood and leave a discoloring residue. Along the same lines, avoid overwaxing unfinished wood floors in an attempt to restore luster. If a waxed floor has become dull, try buffing the surface instead. Cleaning floors with contemporary polyurethane wood finishes (for floors installed after 1970) starts with vacuuming, sweeping or dust-mopping the surface. Vacuum wood floors daily, or at least once a week with a vacuum fitted with an attachment for wood floors. For regular machines, the American Hardwood Information Center advises turning off interior rotating brushes or beater bars if possible. Regular vacuuming helps remove dust and dirt particles that play a leading role in scratching and dulling the surface of the floor. The American Hardwood Information Center says choosing a broom with “exploded tips,” also known as synthetic fiber ends, is step one. Damp mopping should be done with a simple solution of pH-neutral soap (like dishwashing soap) and water; or one capful of a mild cleanser such as Murphy Oil Soap in a bucket of water; or a solution using products specially formulated for wood floors, such as Eco Mist Colloid W, Dr. Bonner’s or Method. In conscientious cleaning circles, controversy swirls around whether to use a mixture of vinegar and water for damp-mopping wood floors. Ultimately, everyone has to do what works best; however, within the past 10 years this method has lost favor, and popular belief now holds that the solution causes floors to dull more quickly and is not as effective as simple soap and water. To begin mopping, dampen the mop in the prepared solution, wring it out completely, and mop in the direction of the wood grain. Repeat as necessary. As the water in the bucket becomes dirty, dump it out and refill. Many experts (including Martha Stewart) believe scrubbing wood floors with a damp cloth by hand is the ultimate cleaning strategy — unless abundant square footage or protesting knees prove problematic. But avoid cloths or mops dripping with water. If your floors do get wet or worse, dry them immediately! Another technique: After the floor has been swept or vacuumed, put your cleaning solution of choice in a spray bottle and mist the floor, then use a dry microfiber mop or cloth and mop in direction of the wood grain. It’s important to note that just because a floor is clean doesn’t necessarily mean it will be shiny. If the floor has lost its luster, it may be time to have it refinished professionally. Whatever you do, don’t wax a polyurethane finish. Unfinished or waxed floors, like those in older and historic homes, as well as floors in which the protective seal has worn away, should never be treated with water or liquid cleansers, which may penetrate, stain or warp the wood. Instead, according to cleaning experts, sweeping with a soft-bristled broom and vacuuming should be done as the primary line of defense. The NWFA says to step away from the mop: Never damp-mop a waxed floor. Beyond basic care, buffing and waxing the floors once or twice a year should maintain the shine. Old-fashioned shellacked floors are not common in most homes. However, if you find yourself the proud owner of this vintage flooring, regular care should include sweeping and vacuuming often. Avoid water and liquid cleansers. Engineered wood flooring is created with a thin veneer of hardwood fused atop a plywood base. The material is stronger and more durable than regular hardwoods, and as a result has become a popular choice. The cleaning procedure for this type of wood is the same as for hardwood floors with urethane finishes. Keep clean on a daily basis by sweeping and vacuuming and use a slightly damp mop as needed. Painted wood floors make a strong style statement and are a clever way to disguise wood flooring in less than perfect shape. To clean them, sweep, vacuum or dust-mop regularly. Avoid scratching or damaging the painted surface by staying away from abrasive cleansers and opting for a simple soap and water solution for damp mopping. Experts suggest drying the surface immediately by hand to avoid streaking and unnecessary moisture. Buying furniture secondhand is the recycling of the design world. Secondhand pieces don’t use any more raw materials, don’t require any more energy to be produced, reduce waste and pollution, and don't require any additional packaging. On top of these pluses, antiques and previously used pieces have that great sense of story and character. While seasoned secondhand shoppers would probably be able to dish out this advice in their sleep, it can often be difficult to know where to start looking if you're not in the habit of hunting. Four professionals very much in the know offer 10 great tips to ease you on your way. 1. Pop in even if you’re not looking. If a shop looks as if there’s even a chance it might sell secondhand or antique furniture, it’s worth popping in to build up your repertoire. “Even if you’re not looking to purchase anything, it’s good to build up a list of places to go for when you do want to,” Bhavin Taylor advises. If you come across something you particularly like, it might be worth snapping it up, even if you weren’t planning to buy anything. Finds can be rare, and you’ll know if it’s special enough. “I often buy furniture even when I don’t know where it’s going to go,” Chris Dyson says. 2. See the item personally if you can. While buying online is extremely convenient, it’s much easier to hide any serious damage in a photograph than it is in person. “I like to be able to touch the item and check it’s in good condition, so I’m not too keen on buying from online resources unless they have an option for you to view it firsthand,” Taylor says. 3. Get out of town. Of course, this varies depending on the town, but sometimes furniture stores in the city can be more expensive than those slightly further out. “To find the best bargains, you need to head out of town to the bigger, warehouse-type secondhand furniture shops,” Orchard says. Yard sales are also an inspired place to look. “They’re my favorite source, and you can get the best bargains,” she says. Some city antiques markets can be excellent resources if you’re looking for something really special, so don’t avoid them altogether. You might have to pay a little more, but if you’re careful, you can find some really great stuff and agree on a reasonable price. “I source most of my stuff at markets, and from eBay if it’s something specific,” Dyson says. “Sites like eBay can also lead to traders who have large quantities of other stock available,” Robinson adds. Go armed with a measuring tape, a pen and an image of your room, so you can visualize how the new item might sit in it. “If I’m looking for a version of something I’ve seen, then I bring an image of that item with me to cross reference, so I don’t get sidetracked and end up buying something I didn’t actually come for,” Orchard says. Don’t forget to measure your doorways and other access points. “There’s nothing worse than buying something and not being able to get it through the front door,” Taylor says. 5. Keep an open mind. When shopping for secondhand furniture and antiques, you can never be certain of what you’ll find on any given day. If you’re unwilling to compromise on the piece you want, you may never find it. “Go with an open mind and don’t look for anything too specific,” Taylor advises. “What you think you’re after and what you find may be worlds apart.” You won’t always get something you had envisaged, and you may have to think creatively to find something that will work in your space. “There are so many antiques and retro furniture dealers out there now who scour these shops daily, so if you see something you like, be prepared to make the purchase quickly,” Orchard says. “While some shops might hold items for a couple of hours if you’re lucky, there’s a strong chance the item will be sold by the time you get back — particularly if it’s a good one,” Taylor says. 7. Improve your pricing knowledge. When you’re starting out, don’t be bothered by the fact you don’t know how much something should cost. As with everything, you’ll develop this sense over time. If you have a smartphone, Dyson advises taking a few minutes to check online whether something is priced reasonably. At most markets and garage sales, it’s acceptable to barter, and you should get a sense of whether it’s appropriate by observing others for a little while. Decide what you’re prepared to pay for an item before entering into a negotiation, and try to stick to your guns. It’s amazing how quickly you can get caught up in the thrill of things and end up spending more than you would have liked. 8. Watch out for costly upcycling. It’s a common mistake to assume that you can upcycle any old thing cheaply and effectively. A good rule of thumb is to purchase only items you know you’ll be able to restore on your own, or know how much it will cost to get it done professionally. 9. Be careful of bad smells and other irreparable damage. Woodworm and rotting wood are big no-nos. Also look out for damaged fabrics, although they might work with the style you’re going for. “Smell fabrics if you can,” Taylor says, as odors such as smoke tend to linger for a long time. “Upholstery can be replaced, but don’t forget that stuffings and fillings might be affected by the smells, too,” Robinson warns. “If you’re buying seating, check that it’s comfortable and that the filling is still good,” Taylor adds. Be aware that things like mattresses can harbor dust mites and germs, so are best avoided. “Things like really bad water damage or burn marks on wood are tricky to get out without specialist knowledge and tools,” Orchard points out. 10. Have fun with it. As you do more and more secondhand shopping and antiques hunting, you’ll get better at scouring for the best buys and hidden gems. “You develop your sensibilities as you go along, and your nose for it gets much better,” Dyson says. “Much of it is to do with experience,” he adds, so the sooner you start, the faster you’ll improve. How much do you really save when you do home projects yourself? 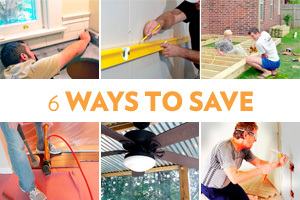 And which DIY projects have the highest ROI in terms of saving? HouseLogic tells you. With the start of summer (and the end of school) this month, June is the perfect time to prep your house and yard for a season of relaxation and fun. And if you’ve fallen behind in your house chores, don’t worry — you can use this month to catch up, too. Give your kitchen a summer refresh. Pull out the tools you use more in summer (hello, ice cream maker!) and put them in easier-to-reach places. Clear the counters to make room for fresh farm-stand produce, and declutter the cupboards and pantry. Catch up on home maintenance. No one is perfect! If you've fallen behind on some home maintenance tasks, use the longer days and pleasant weather to your advantage and tackle a few projects you might have missed (like cleaning out your garage). Scan past months’ to-do lists for ideas. Use your shed for more than junk. Once your garage or garden shed is cleaned out, put it to work as a potting shed, an art studio or a workshop. It’s more likely to stay clutter free if you’re using the space. Prep for summer fetes. Having some party staples (and ready-to-go gifts) on hand makes a month of graduations, celebrations and birthdays easier to handle. If you're planning to host any parties this month, stock up on beverages, fuel for your grill and frozen party snacks now. Clean out kids’ rooms and store memorabilia. Sort through kids’ art and school projects that come home at the end of the year and pick out a few special pieces to keep. Clean out bedrooms and playrooms, donating toys they have grown out of and putting summer favorites in an easy-to-grab spot. Keep a handle on collections. Love hitting flea markets, yard sales and antiques fairs in summer? Whether you collect vintage kitchen tools or antique quilts, it is possible to have too much of a good thing. Keep your collection all in one place, and be mindful of what will fit in your home comfortably before adding more pieces. If you don't really need more (but love the thrill of the hunt), consider selling a few of your least favorite pieces to make room for new acquisitions. Assess games and gear. Pull out the lawn games, beach toys and board games so they're ready for enjoying during summer downtime. But be sure to peek inside those boxes. If the Monopoly money has gone missing, or you're short on chips in the poker set, replenish or replace them. And if you never use that croquet set, give it away or sell it at your next yard sale. Have dinner outdoors. Longer light in the evenings and pleasant weather make for perfect conditions for dining alfresco. Even a simple weeknight dinner feels special when enjoyed outside! If you want to make your outdoor dining area feel extra special, string up cafe lights overhead and line the center of the table with candles.